REGISTRATION is OPEN for the 2018-2019 Year! We are excited to dance with you! 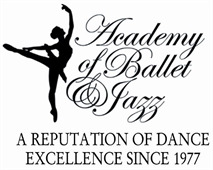 I have read and understand Academy of Ballet & Jazz tuition policies and contract. I hereby release, indemnify and hold harmless ABJ and their faculty from all liability or claims however rising. I authorize the staff at ABJ to give permission for medical treatment in case of serious illness or injury. I authorize ABJ to record and photograph my child's image for use by ABJ for advertising and promotional purposes in print or electronic publication. **By checking this box, I acknowledge that I am financially responsible for the registered child herein. As the responsible parent/guardian, I am fully and solely accountable for my child's account. I am NOT registering my child with the intent of another party to be financially responsible for this account. Tuition is based on enrollment for a full school year. Tuition is divided into NINE equal monthly installments (September-May), two semester payments, or one yearly payment. Please understand that the ninth and final monthly tuition installment is due in May before Recital. All tuition payments are non-refundable. A late fee of $20 will be assessed to any unpaid monthly tuition on the 16th of each month. Any account that is more than 60 days past due will be assessed a 20% late fee and the student will not be allowed to participate until the overdue balance is paid in full. Monthly statements are sent via e-mail ONLY so please provide a valid e-mail address upon registration. Also, please contact ABJ if any of your contact information changes. If a student does not wish to continue, a drop card must be filled out by the last scheduled class of the month for the account to be inactivated. Monthly charges will continue to accrue until a drop card has been received, regardless of the number of absences. The account holder is still responsible to pay accrued charges until a withdrawal card is received by ABJ. Our payment options are changing as of Fall 2018! We are moving to an Auto Pay system. You may choose the 1st or 15th of the month to have the card on file charged. You may also choose Monthly Tuition ONLY or the Full Balance (monthly tuition including recital fee and costume fees). **We require a valid credit/debit card on file per account. Our portal address is https://app.jackrabbitclass.com/portal/ppLogin.asp?id=518831. ***Any remaining balances on my account after the final due date in May (May 4 before recital), will be charged automatically to the card on file. I understand that putting my credit/debit card information in our system does NOT automatically enroll me in Auto Pay OR automatically charge my card the registration fee upon enrollment. You must log in to the portal and physically pay $35 for the registration fee. If you are a new student/account, this charge posts automatically upon registration. If you are a previous student/account, this charge has to be manually entered by an ABJ staff member and will be posted as soon as the registration is received via email. You still may go ahead and pay the $35 and we will apply it to your reg fee. Please contact the studio at 205.752.5124 with questions. **We now require a valid credit/debit card on file per account at all times.